Obviously, I haven't updated in a while. That's because I was having trouble getting my medical records to my doctor, therefore no appointments were followed up and nothing was happening. There are only so many times I could write about how much I hate certain things about myself, how frustrated I am that I can't seem to change. Well, it's a new year. 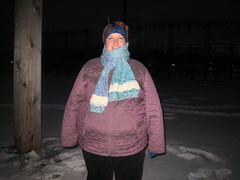 As of January 1, 2009 I weigh in at 267.6 pounds. A healthy weight for me would be 118-159. I would be ecstatic to get back down to 180, but at this point even that would mean losing almost 100 pounds. My BMI is 42, and a healthy BMI would be topped off at 25. Here's the good news. As of December, I am seeing a new doctor. She is a women's health doctor, she does pregnancy/fertility stuff but seems like exactly what I'm looking for - a doctor who will look at my health as a whole, the big picture. Sure, I might like to get pregnant again. We haven't made a final verdict on that whole issue yet. But my main goal here is to figure ou t why my body is how it is. Why my hormones aren't right. Why the rapid weight gain. And HOW do I fix it? I don't want to be diabetic, and I don't want to lose my breath going for short walks. I don't want to be the embarassing fat mom who can't play with her kid right. One of my New Years Resolutions is to use the gym membership my Mom bought me by going to the gym 3 times a week or more. I know it's totally typical, but this HAS to be the year. 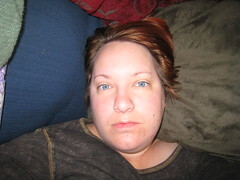 I have to figure things out and I have to lose this weight and get in better shape. I just HAVE to. At my first appointment, she recommended Weight Watchers, but I just can't spend $40 a month on that when we don't even have enough money to pay our bills. So, we'll see. There is a coupon for a free month, so maybe I can try it out and if I like it I can try to do it on my own. I'm just not sure. Last week I had blood drawn to do a workup for PCOS, and on Monday I had an ultrasound to check what's going on in there. Once again, my cycles have gotten longer (my last one was over 60 days, and I'm currently at day 34 of the new cycle. I have a followup appointment with my new doctor this Thursday and will post again then about what happens. From now on, I'm using this blog. I need it. I need a place to write what I'm feeling about this small aspect of my life. I need to record this journey. I'm scared. I'm scared that I'm going to fail. That I'll make goals and never be able to meet them. Speaking of which, who's your doctor? I'm looking for one in Bellingham, finally, and I need to find someone who knows at least something about PCOS. write it sister! write it! and, hey, i just have to laugh a little that ur ideal weight range is so out of whack...what do they know??? 118-159??? little bit o difference there! my range...are you ready?? 88-120...i'm sorry, seriously???! your blue eyes are gorgeous! the weights for BMI averages are all kinds of wrong. if I weighed in my normal range I would look like skeletor - I know I was there once and it wasn't pretty, healthy, or comfortable.